Slauson staff will wear their Heroes in the Hallway T-shirts every Wednesday in October to show support for anti-bullying. Schools across the country observe this month are taking many approaches to National Bullying Prevention Month. 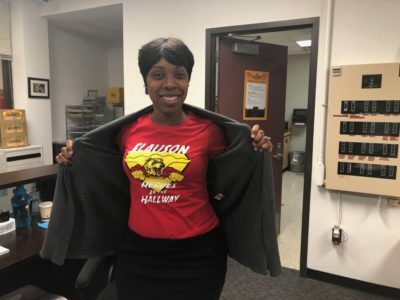 Many middle schools have taken on the Heroes in the Hallway initiative, including Slauson Middle School, which has adapted the theme to fit the Slauson culture. Principal Lisa Anglin says the goal is for students to individually and collectively explore ways to stand up against bullying. Self-Contained C.I. 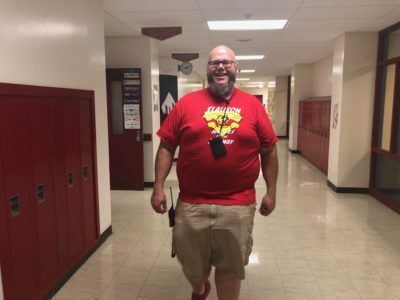 Teacher Rob Finkle is a hallway hero. 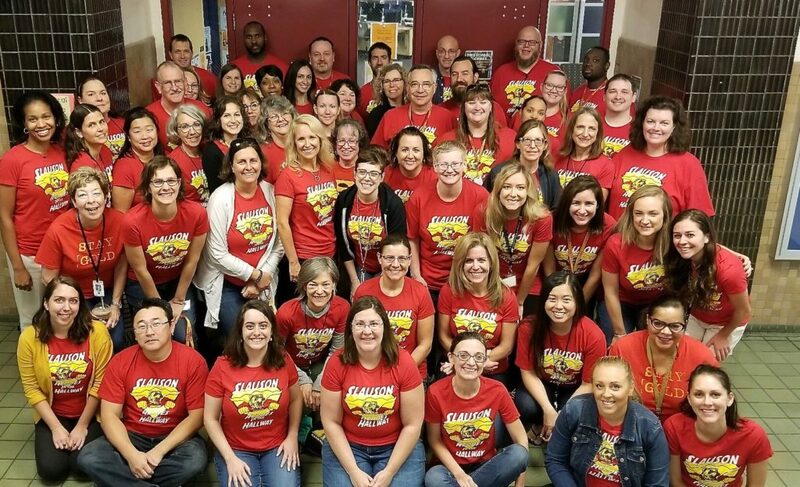 Every Wednesday in October, all Slauson staff will wear their Hero in the Hallway shirts, which were designed by art teacher Jason Treece. The idea is to promote safe hallway conduct and student awareness around anti-bullying activity. Class Office Professional Kaecy Corbin shows off her new T-shirt. 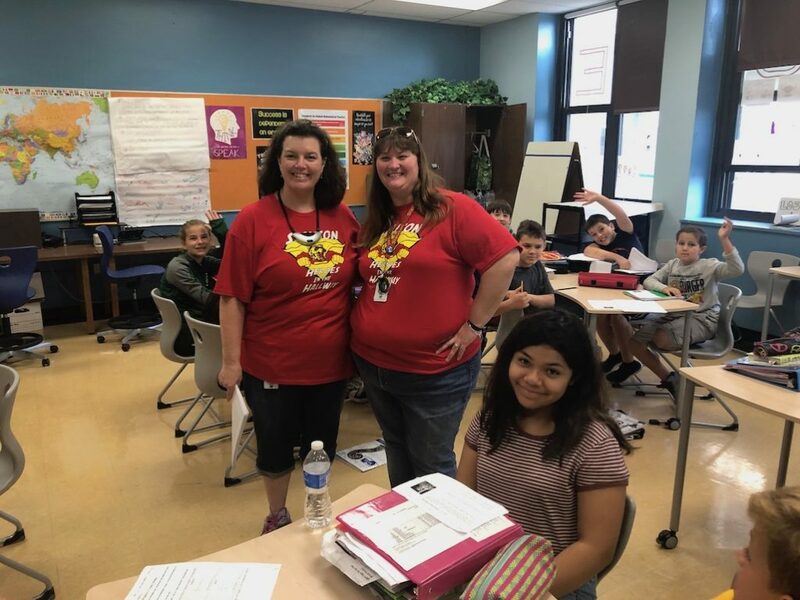 Slauson has recognized October as Anti-Bullying month in the past, but this is its first year incorporating the Heroes in the Hallway initiative. Math teacher Diane Grant and paraprofessional Jen Siemiesz show their support. This is s wonderful idea. Students need to understand just what behaviors constitute bullying and be willing to see it in themselves, their home, their school and community. It is a very big problem in an age of entitlement and minimal expectations for taking responsibility. Having the courage to speak out is rare but if the consequences, often very hurtful and sometimes dire or fatal, are understood, perhaps we can have a shift towards kindness and generosity of spirit towards one another despite the sometimes poor adult modeling. Thanks for your efforts and I wish you all the very best of success on this project.